Hope’s Relief gel-lotion is a unique formulation with 7 active natural ingredients, which calms the skin whilst penetrating deep to moisturise dry and itchy skin. Skin feels soothed making it ideal for babies and children. Hope`s Relief Gel-Lotion contains natural aloe vera plus 6 additional natural skin moisturisers and anti itch ingredients including sea buckthorn, marshmallow root and chamomile. Developed by naturopaths, Hope`s Relief gel-lotion is free from skin irritating nasties including steroids, fragrances, SLS, parabens, paraffin, lanolin and petrochemicals. Aloe Vera, Aqua, Glycerol, Calendula, Chamomile, Sea Buckthorn, Marshmallow, Phenoxyethanol, Vitamin B5, Benzyl alcohol, Xanthum Gum. 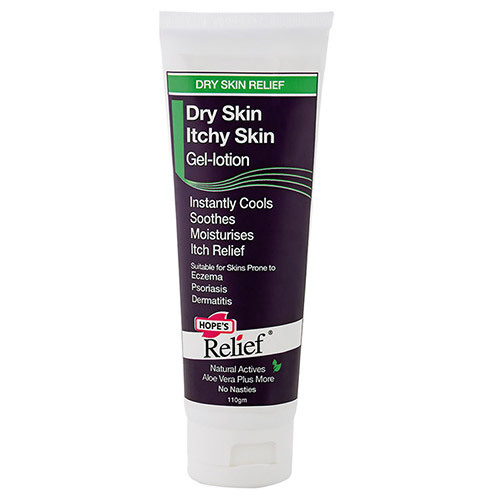 Apply 3-4 times daily or as and when needed for the relief of itching associated with eczema, dermatitis and psoriasis. Below are reviews of Hope`s Relief Dry Skin Relief Gel-Lotion - 110g by bodykind customers. If you have tried this product we'd love to hear what you think so please leave a review.